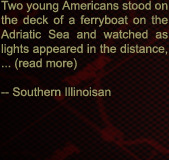 CARBONDALE -- Two young Americans stood on the deck of a ferryboat on the Adriatic Sea and watched as lights appeared in the distance, revealing the coastline of Albania. It was dusk, and in the fading light of a spring day, the young men were able to make out the hulls of abandoned ships, half-submerged in the harbor of the port city of Duress. Helicopters hovered overhead, and the two passengers knew them to be military craft. The year was 1999 and a bloody war was spilling over into Albania from neighboring Kosovo. * The Americans were film student James Saldana and photographer Jeff Norman, who had traveled from their Chicago homes to film the stream of refugees who were flooding the Albanian border towns in a desperate attempt to escape the carnage that had left thousands dead. As the ferry docked in Duress, a groundswell of noise overpowered the sound of the helicopters overhead. Saldana and Norman felt a flash of fear as they realized that the noise was thousands of people yelling. Refugees, packed like sardines behind a series of fences, were shouting with a desperate fury that was focused on the ferryboat entering the harbor. The crowds of refugees wanted one thing, and they all wanted it at once. They wanted to get out. Not for the first time, nor the last, the two students wondered just how big a mistake they had made. If the ferryboat captain had not taken their passports from them, they might have decided to turn back. As it was, they made certain that their video cameras were well-hidden beneath their coats, then lined up to follow their fellow passengers off the ramp and into Albania. Three years and two trips later, Saldana received a letter from the director of the Angelus Awards, one of the most prestigious student film competitions in the country. His film, "Our Road to Kosovo," had been named a finalist for the 2002 awards, beating out hundreds of entries, many from students at well-heeled film programs such as those at Harvard and Stanford. Saldana, now a graduate student in Southern Illinois University Carbondale's Interactive Multimedia program, will travel to Hollywood in mid-October to pick up his prize at the Angelus Awards ceremony. He won't know until then exactly which prize he won. But people in SIUC's College of Mass Communication and Media Arts are already thinking that the college as a whole is a winner, because Saldana and his crew succeeded in putting the department on the map -- and this on a skeletal budget that often didn't allow for food. "It's true. Sometimes we depended on the refugees for food," Saldana said. "Looking back, I sometimes wonder how we did it. There was an air of danger there, and we definitely felt it. Albania is not a tame place, but I wanted the story of the refugees to be told. "I had seen Dan Rather on TV interviewing refugees and I thought, 'If Dan Rather can go to Albania and talk to people near the fighting, then so can I," he said. Saldana called Norman and asked him if he wanted to do something crazy. Norman was game. The plan was for Saldana to shoot film footage of the refugees, while Norman took photographs for a separate project and helped out with interviews. Three weeks later, in May of 1999, the two were on a plane to the Italian city of Trieste, where they caught a train to Acconca, a port on the southeastern coast of the Italian peninsula, on the Adriatic Sea. 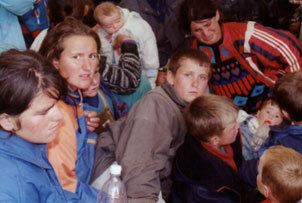 From there, they boarded the ferry for the 24-hour crossing to the Albanian city of Duress. Saldana and Norman slept on the top deck of the ferryboat, shielding themselves and their cameras from the salt wind and sea spray that blew intermittently over the boat's railings throughout the night. After a long day at sea, as the sun was setting, the students saw the lights of Duress in the distance, and knew that they were finally about to enter Albania. "We had to pay the ferryboat captain to give us our passports back," Saldana said. "After that, we decided to pretend that we were from the Azores, because everyone assumed that Americans are rich and we had very little money." The plan was to get to the border town of Kukes as soon as possible, where international efforts had established refugee camps to accommodate the flood of people fleeing Kosovo. Saldana and Norman decided to spend the money for a cab ride and a hotel. "We spoke in a kind of gibberish we made up as we went along, and made a lot of hand gestures," said Saldana. "We pretended that we were speaking Basque -- we counted on the fact that no one we met would know what Basques sound like. We were right; no one did. They tried English, Italian, French and German on us, but we kept saying 'no, no' and waving our arms around. Then we'd draw a little map of Spain with an island off the coast and we'd point to it and say energetically 'Azores, Azores.' I think a lot of people probably suspected that we were faking." The next day, the two students joined a group of people in a crowded minivan for the nine-hour trip to Kukes. One of their fellow passengers was a teenage boy who was on his way to join the Kosovo Liberation Army. As the van zoomed along narrow mountain roads, stopping periodically for military checkpoints, Saldana began to fear for his life. "It was absolutely nerve- wracking," he recalled. "We were going so fast, along 400-foot drops, that any accident would have been fatal." Norman and Saldana, sitting in the back of the van, couldn't communicate for the duration of the journey. The two Americans tried speaking to each other softly when they thought no one was listening, but as soon as they spoke English, the other passengers turned around and looked at them suspiciously. 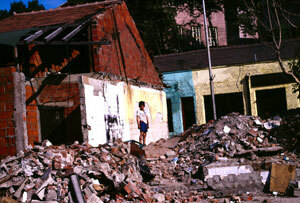 By the time they arrived in Kukes, they had decided to abandon their attempts to pass as Azores citizens. When the minivan finally pulled into the border town it was almost midnight. Saldana and Norman, with nowhere to sleep, walked along the quiet empty main street of Kukes and straight into a group of armed soldiers. "We didn't know there was a military curfew, and that we were breaking it," Saldana said. "The soldiers kept asking us 'What army?'" We said 'Press, press,' because they didn't get the idea of independent filmmakers. So then they warned us about the dangers of robberies and directed us to a hotel -- a very expensive hotel -- that catered to the press." The young men decided to spend just one night in the hotel before entering the refugee camps. After checking in and getting settled in their room, Saldana and Norman went down to the hotel bar for a drink. The place was filled with members of the Kosovo Liberation Army. "At first, we weren't sure they were rebels," said Saldana. "So we asked a woman sitting next to us 'What army?' She looked at us, then over at them, and back at us. Then she said, 'I don't think I should say.' So, we figured out it was the KLA." The next night, the filmmakers went to a refugee camp in a wooded area on the outskirts of Kukes and prepared to settle in. They didn't have much luck at first. The ground was so packed down from the weight of hundreds of human feet that Saldana and Norman couldn't get their tent stakes into it. They were trying to decide what to do when a few Albanians approached them. "We thought they were going to kick us out, but they had come to help us," Saldana said. "And, in fact, they invited us to stay with them." The refugees had been living in two tents, but with the arrival of the Americans, the Albanians moved their entire family into one tent, leaving the other for Saldana and Norman. As evening fell, the nine refugees and the two young men crowded into one tent to talk and get to know one another. They ended up talking far into the night. "Nobody knew what anybody else was saying, but we were happy. We were happy to be together," Saldana recalled, smiling a little at the memory. "We did a sort of show and tell, showing them all of our equipment. Life is boring for refugees -- days and months of waiting to go home. They were excited about our filming, because they wanted the world to know what was happening to them." The Americans shot most of their film right there in the Evergreen Camp. The first family they met introduced them to families who spoke English, and soon Saldana and Norman were hearing stories of heartbreak and cruelty. An old man told them he had just been interviewed by CNN because two of his sons had been killed by Serbian forces. Now the man had just found out that his third son had also been killed. Serbs had arrived in his village, dragged the men into the street, and shot them. The next day, when the villagers asked to bury their dead, the Serbs refused, and burned the bodies in front of their relatives. "You could see the tears in the old man's eyes, and hear the sadness in his voice as he told us about his lost sons," Saldana said. "His wife was going crazy with grief. All of their sons were gone." Saldana and Norman remained in Kukes for several weeks, shooting as much footage as they could before returning to Chicago. Their budget was so tiny that they often relied upon the refugees for food. Saldana was arrested twice, once by Albanian soldiers when he was filming on a military landing strip, and again by Arab soldiers at a neighboring refugee camp. He managed to talk his way out of both situations. Over the next two years, Saldana graduated from the University of Illinois at Chicago and raised funds for his film. The young director never had enough money, but eventually recruited a volunteer crew of six other students, christened the crew "Team Kosovo," and headed back to Kosovo on a shoestring budget in 2000 during the NATO occupation. Team Kosovo returned once more, traveling to Macedonia in 2001 with the 82nd Airborne division. Early this year, Saldana, by now a graduate student at SIUC's Interactive Multimedia program, and fellow grad student Richard Carsley submitted their film [Work-In-Progress cut] to the Angelus Awards, the nation's premier student film festival. Saldana and Carsley, who produced "Our Road to Kosovo," weren't sure what to expect. This year, 425 student filmmakers shipped their movies hopefully off to Los Angeles, so Saldana and Carsley knew they had a lot of competition. They were overjoyed when Saldana was notified at the end of August that he was a semi-finalist -- but they were ecstatic when they got the word that "Our Road to Kosovo" had been chosen as a finalist in the documentary film category. Saldana knows that he won something, but he won't know exactly what until he goes to Hollywood on Oct. 11. After that, "Our Road to Kosovo" makes its world premiere at the Directors Guild Theater in Hollywood on Nov. 14.